What shouldn't your cabinetry does not have slide out shelves? OF THE DIFFERENT HEIGHTS & SIZES AVAILABLE, WHICH ONE IS RIGHT FOR ME? Henry Ford had a saying, "you can have any color you want as long as it is black!" That may have worked back then, but today's consumer wants choices, and rightly so. When purchasing cabinets, few of us would say, "just give me what everyone else has." At Slide Out Shelves, LLC, we want your choice of roll-out shelves to be custom for your kitchen and your storage needs. This is why we offer slide out shelves in different heights, widths, depths and configurations. 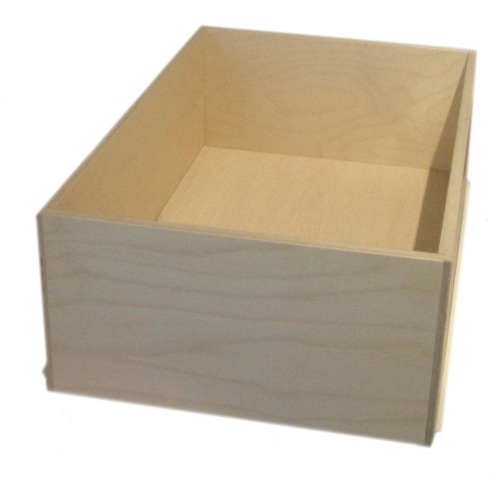 Because not every cabinet is 15 inches wide, we offer our drawers from 6 to 36 inches wide. Bathroom, Kitchen and Pantry Cabinets can range from 10 to 26 inches deep, so we offer depths from 10-26 inches. And you need cabinets to store different sized items, so our pull out shelves come in many different heights. 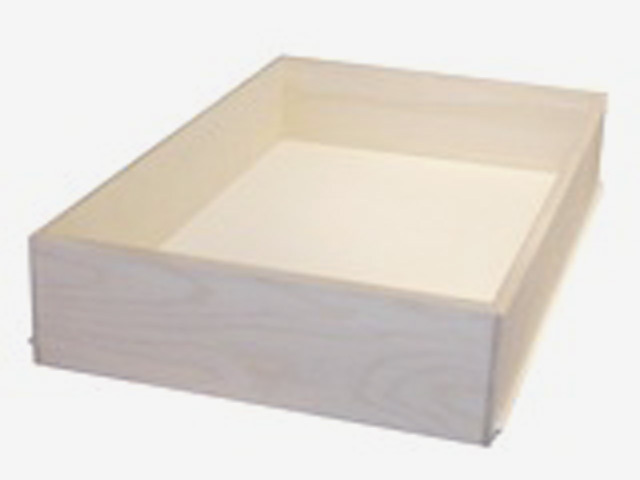 This shelf or tray is the shortest side-walled shelf that we produce. The outside dimension is 2 3/8 inches tall, the bottom is 1/4 inch thick which is "dadoed" 3/8 inch up from the bottom. This leaves the inside wall height at 1 3/4 inches. This is why it is considered a roll out "tray" by many. 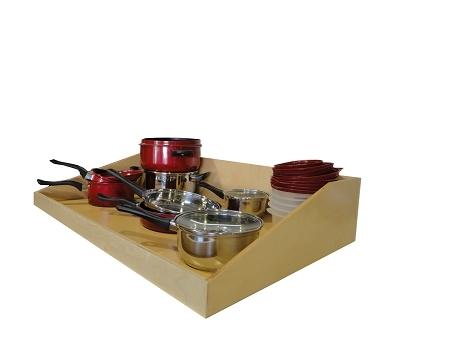 Our roll out tray will hold items such as pots and pans that will stack inside each other and have some weight associated with them. These shelves are limited in what they will effectively hold. If we had to have just one height in all of our cabinets, this is the one we would choose. The extra 1 1/8 inch allows greater storage flexibility, so we could store not only pots and pans but light items that stack, such as plastic containers - without worrying about them falling off the back. This shelf has tall enough sidewalls to prevent items such as a paper towel roll from falling out. We install this height of shelf in the bottom of base kitchen cabinets and compliment the cabinet with our 3 1/2 inch tall shelf for the middle of the cabinet. The 4 7/8 inch tall shelf is standard height for most pantry cabinet shelves. We started making the 6 inch tall drawer for a cabinet company that needed replacement drawers. 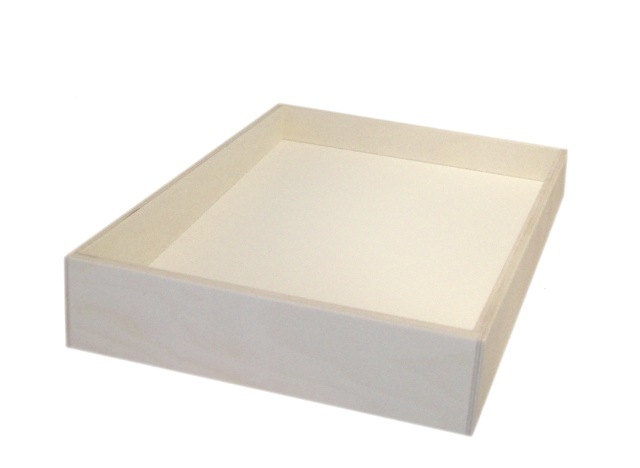 We liked the size of this drawer so much that we decided to offer it to all of our customers on our website. We have had such overwhelming success with this shelf for pantry cabinet roll outs that we have stayed with it. All pantries should include at least one 7 3/8 inch tall slide out shelf. This shelf is the ideal pantry shelf as it is tall enough to prevent cereal boxes, 2 liter bottles, stacked cans and snack food bags from tipping out. We produce this tall drawer for filing cabinets. With its depth, a filing system will fit into most any cabinet. The slanted pull out shelf is the most versatile shelf that we offer. 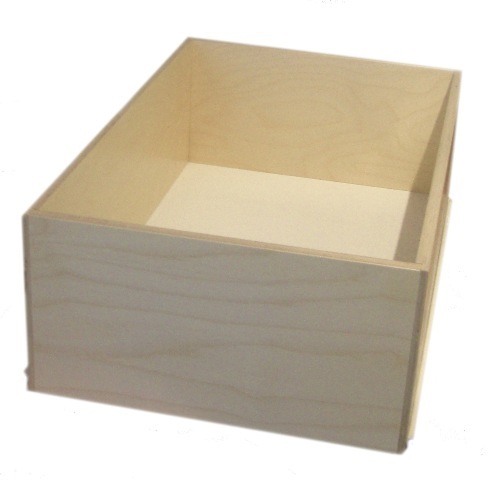 Every shelf we offer from 2 3/8 inches to 7 3/8 inches tall can have the sidewalls slanted. Call Slide Out Shelves, LLC today to discuss height and width needs for installing pull-out shelves in your home: 1-866-374-3583.